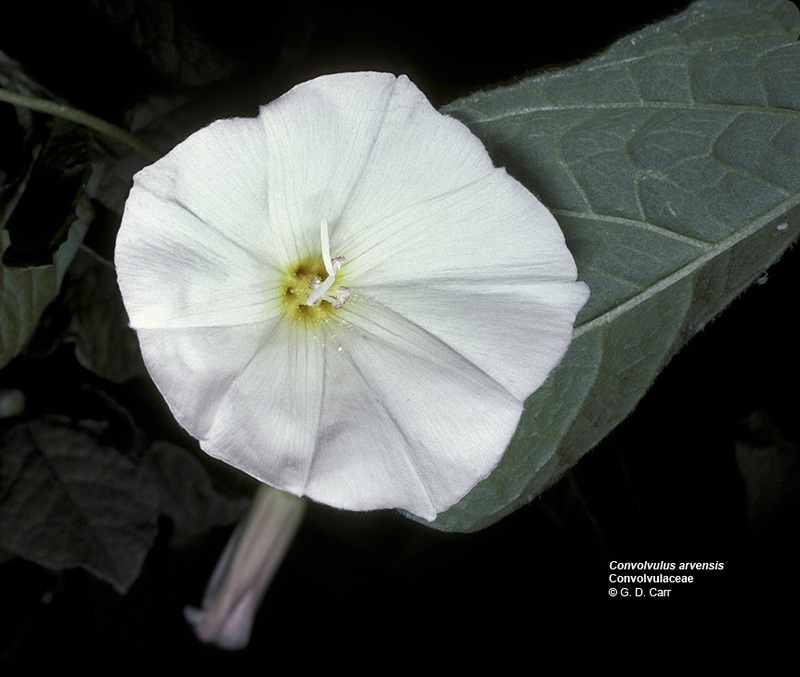 The Convolvulaceae are mostly twining herbs or shrubs, sometimes with milky sap, comprising about 85 genera and 2,800 species that are further characterized by almost always having the flowers solitary or in terminal or axillary dichasia. 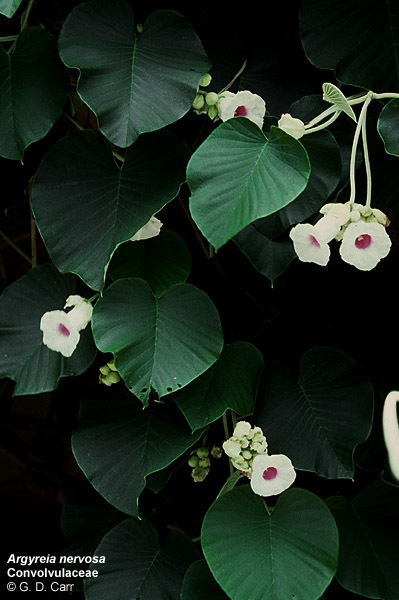 The leaves are simple, though sometimes lobed to pinnatisect, and alternate; stipules are absent. 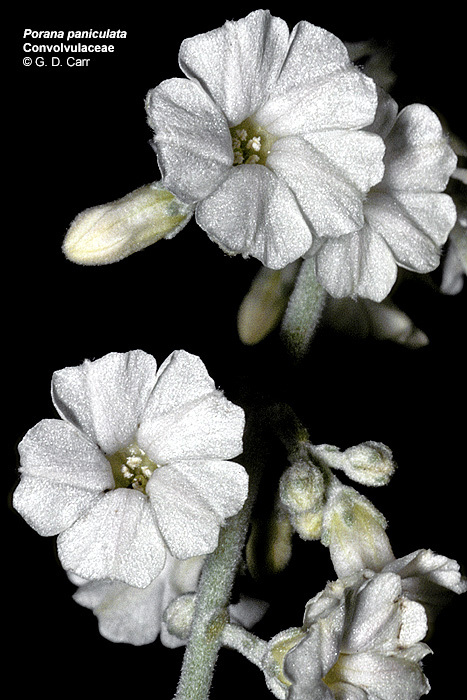 The flowers are actinomorphic, often showy, and nearly always bisexual. The perianth and androecial whorls are 5-merous. 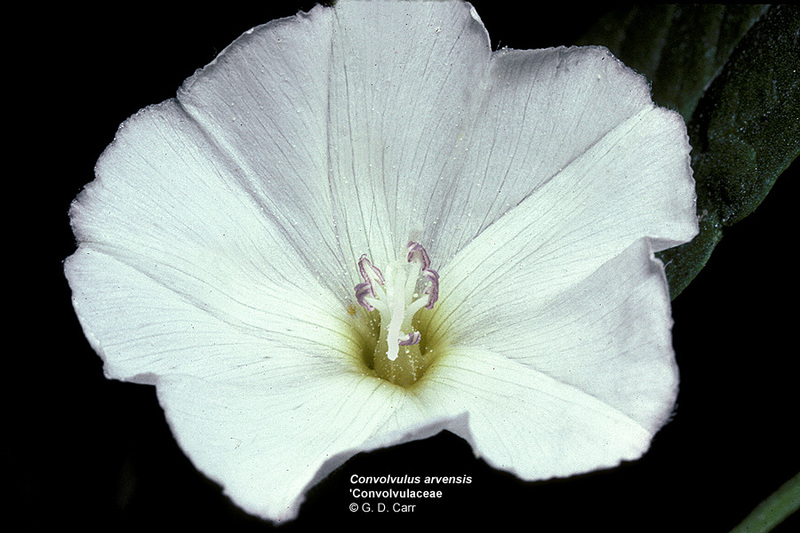 The sepals of the calyx are usually distinct but the corolla is strongly sympetalous, plaited, and often rotate or trumpet shaped with inconspicuous lobes. 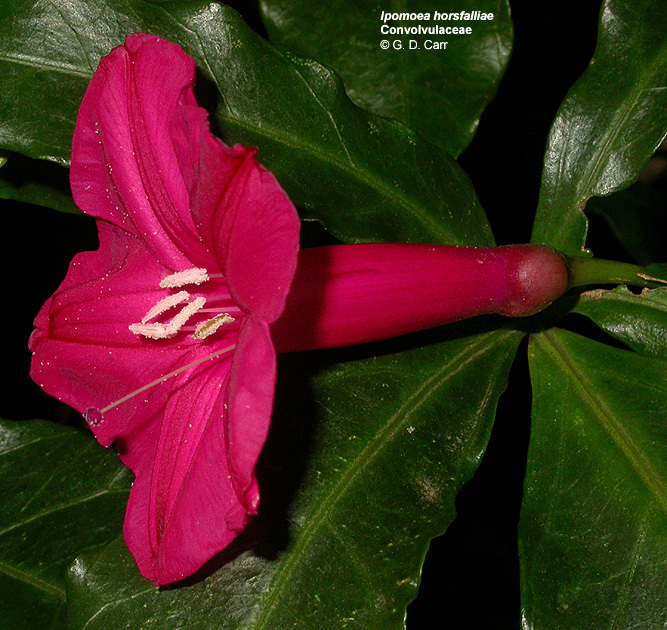 The stamens are often unequal, and are adnate to the base of the corolla tube and alternate with the lobes. 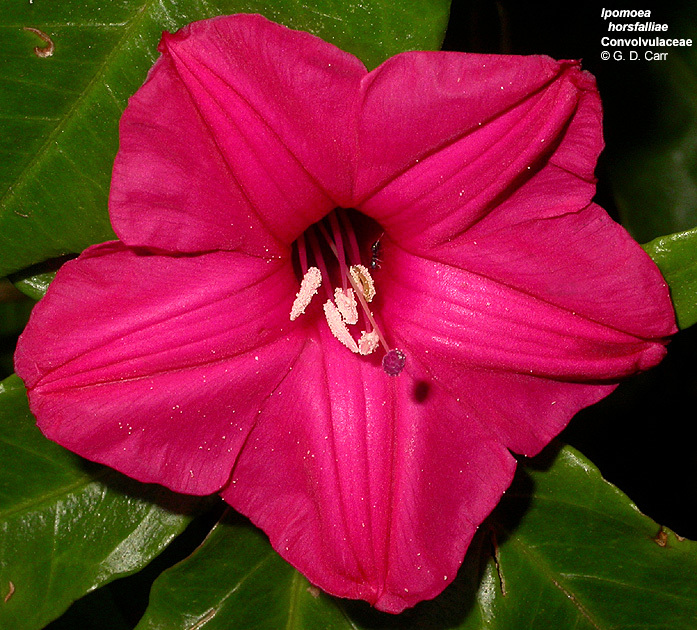 The gynoecium consists of a single compound pistil of 2 or rarely up to 5 carpels, usually an unbranched or 2-cleft style, and a superior ovary of 2 or sometimes up to 5 locules, each with 1 or 2 axile ovules. A prominent annular nectary disk is usually present around the base of the ovary. 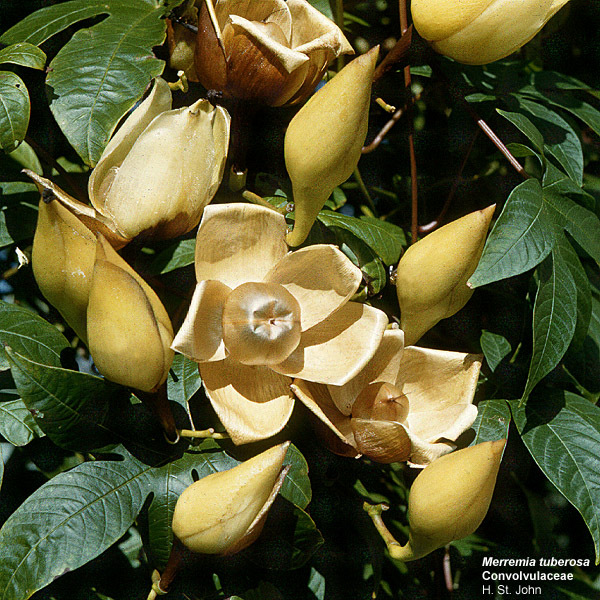 The fruit is usually a loculicidal capsule. 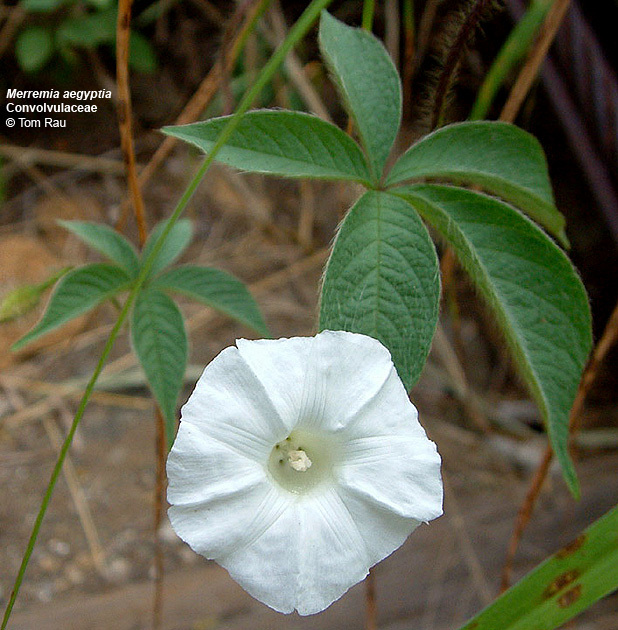 Argyreia nervosa, woolly morning-glory. 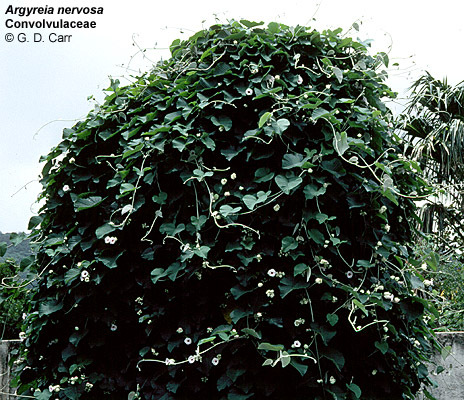 This coarse vine nicely represents the features typical in the family. 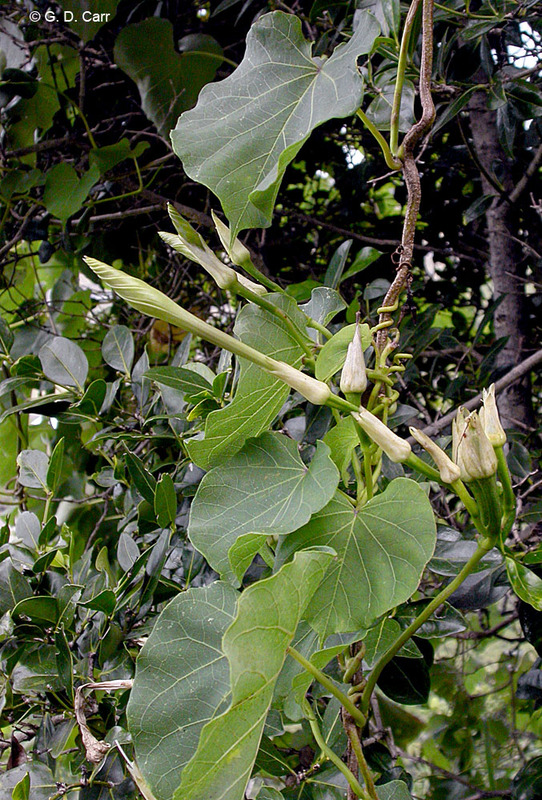 Note the alternate leaves. 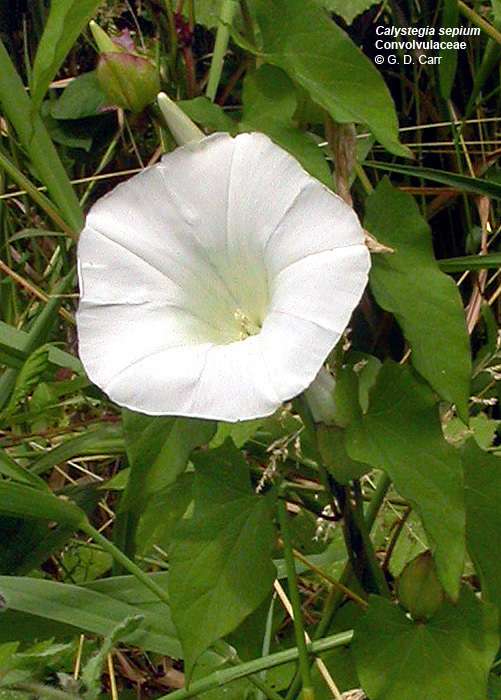 Calystegia sepium, large wild morning glory, Avery Park, OR, July 2004. 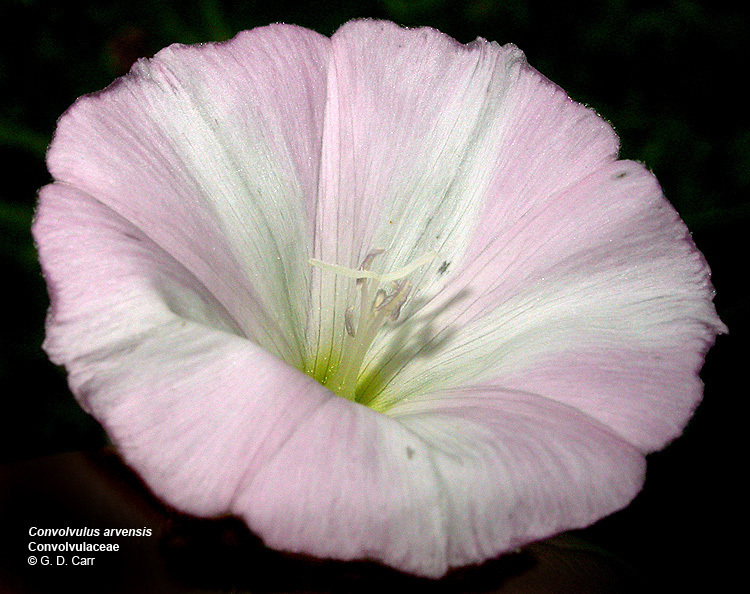 Convolvulus arvensis, morning glory, bindweed. 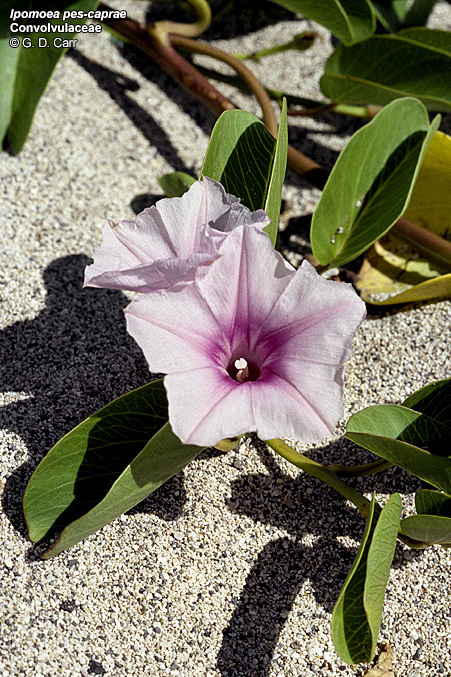 Ipomoea tuboides, Hawaiian moonflower. Kealia Trail, Oahu, HI, 2005. Ipomoea batatas, sweet potato. The vining habit is common in the family. 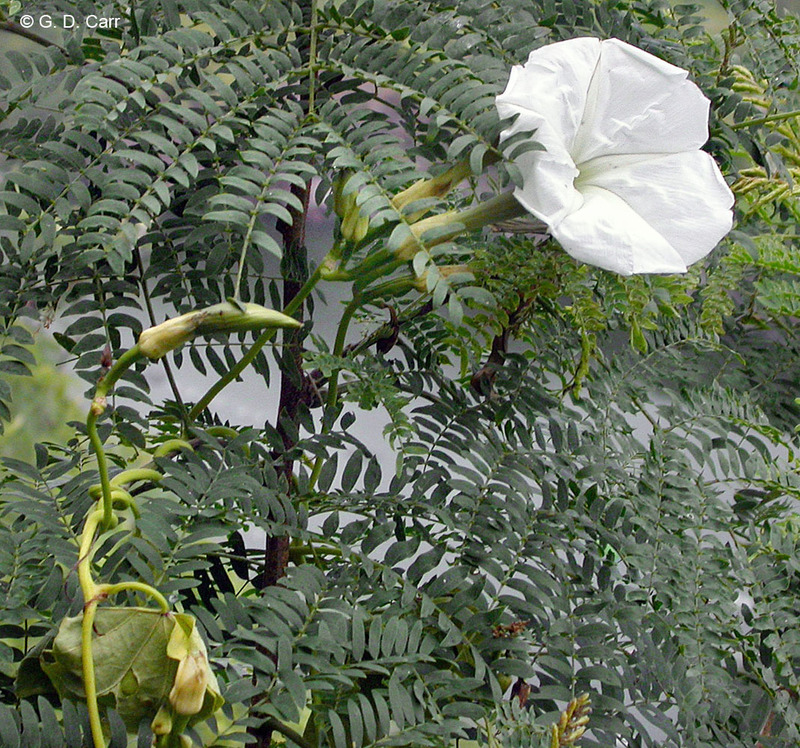 Note also the nearly unlobed, rotate corolla with creases or plaits where folding occurred in the bud. 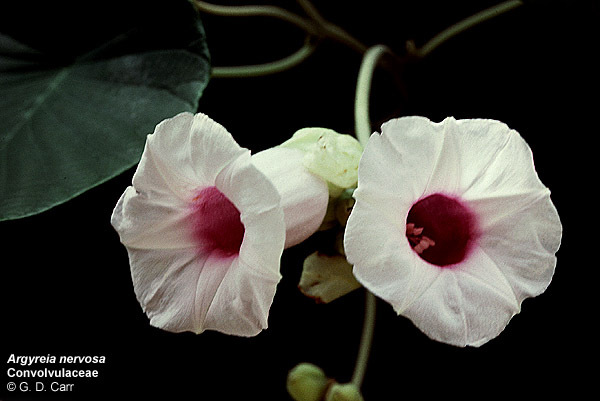 Ipomoea horsefalliae, princes vine. This species has deeper lobing of the corolla than is typical for the family. The plait or fold creases are very evident. 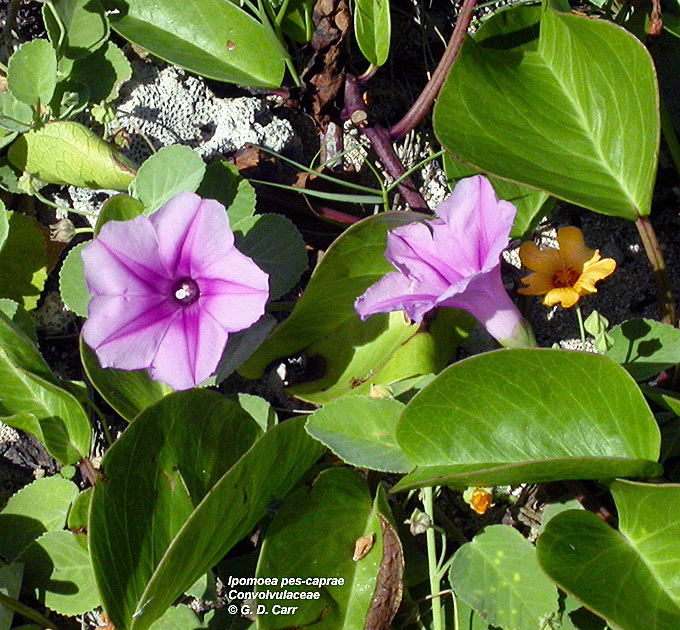 Ipomoea pes-caprae, pohuehue. 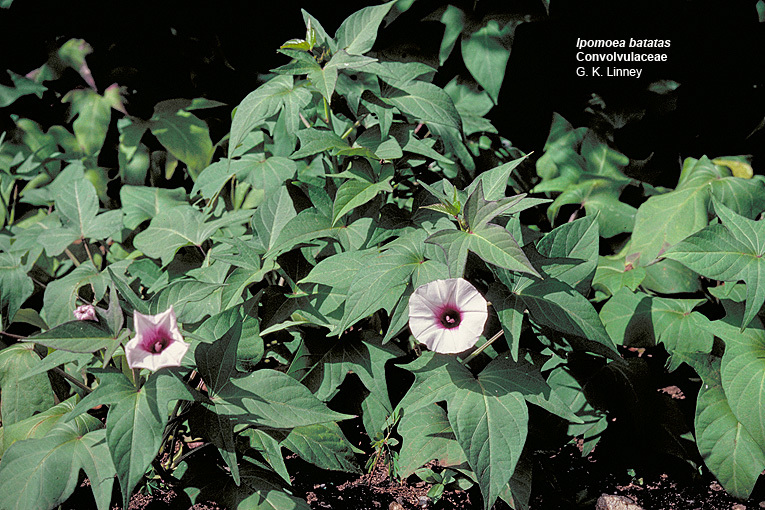 The plaits of the corolla are clearly visible in this Hawaiian native beach morning glory. 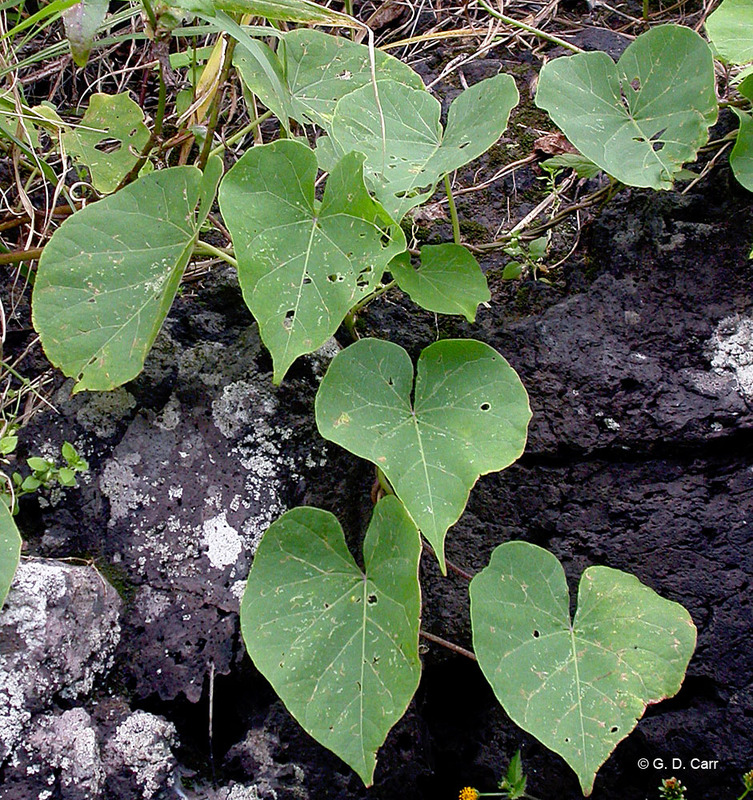 Jacquemontia ovalifolia, pa'uohi'iaka. 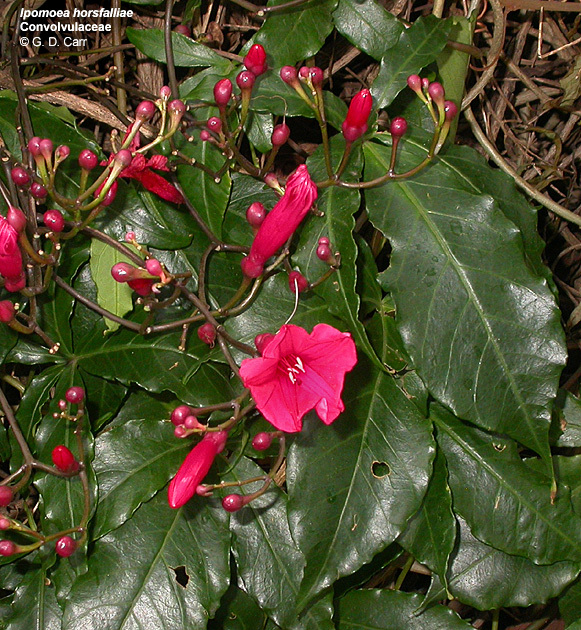 This Hawaiian native exhibits flowers typical for the family. 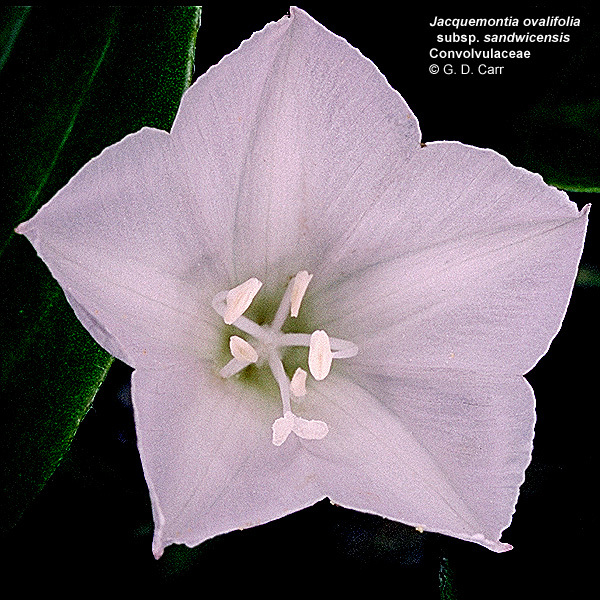 Note the two stigma lobes, unequal stamens, and the lines on the trumpet-shaped corolla corresponding to the folds or plaits it had in bud. 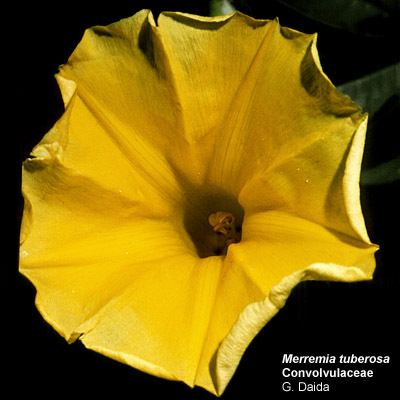 Merremia tuberosa, wood rose. 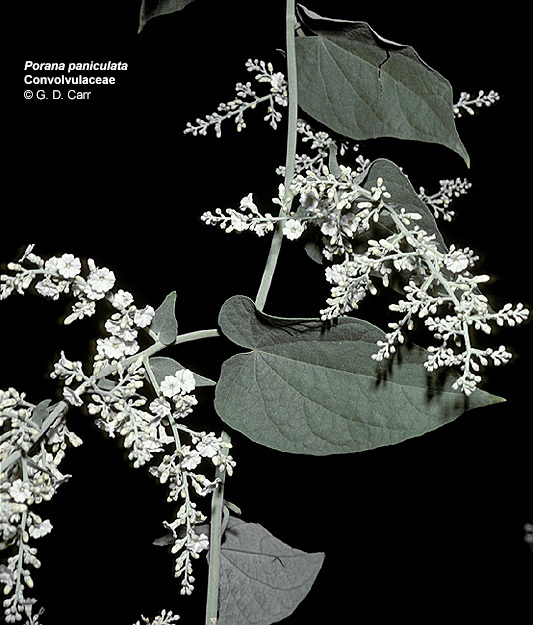 The capsular fruit and persistent sepals (right) in this species resemble a flower and make it popular for use in dried floral arrangements.